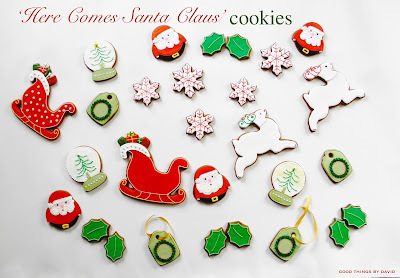 Here comes Santa Claus right down Santa Claus Lane with some tasty cookies for special individuals in my life. 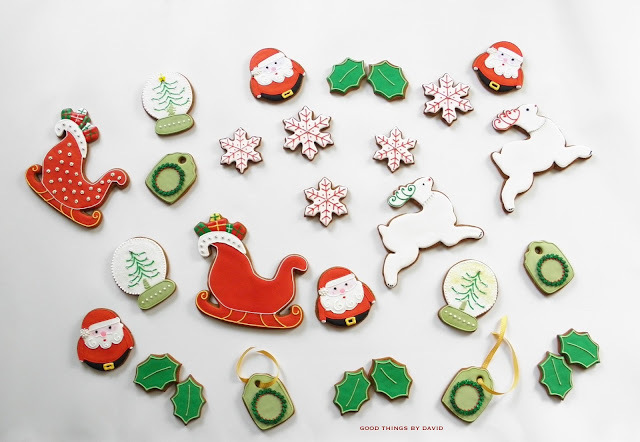 This year's Christmas cookies were made with a favorite gingerbread cookie recipe of mine, and were decorated with royal icing tinted in seasonal shades. 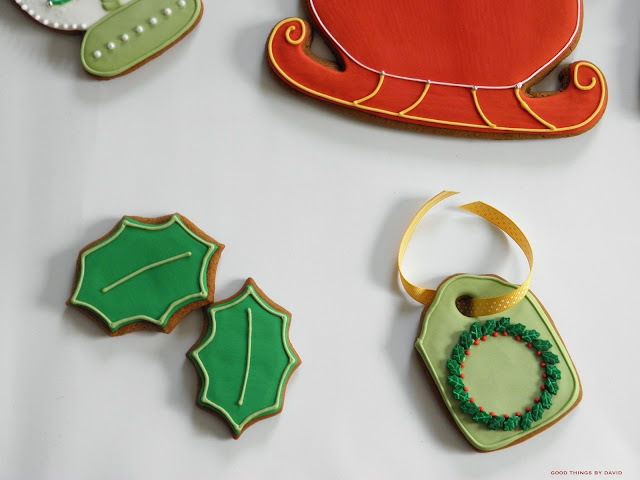 I took out some heirloom cookie cutters that I had my eye on, as well as some easy-to-find shapes that I knew would capture the spirit of Santa bringing all sorts of good things. If you want to invoke some of that magical Christmas spirit in your household, I don't see how you could go wrong with these charming cookies in the shapes of Santas, sleighs, snowflakes, holly leaves, gift tags and snow globes. They make great additions to any dessert buffet, but they make excellent holiday gifts for friends and family. Choose one of these designs and make a few cookies or use all of the designs to make dozens this week. For these cookies, make a couple of batches of my gingerbread cookie recipe, and roll out each portion to a 1/4" thickness. Make sure the dough is rolled out right from the refrigerator for the best results. The cut out shapes must then be chilled again before being baked. I like to work with this dough while it's cold and I always roll it out between floured pieces of parchment paper. 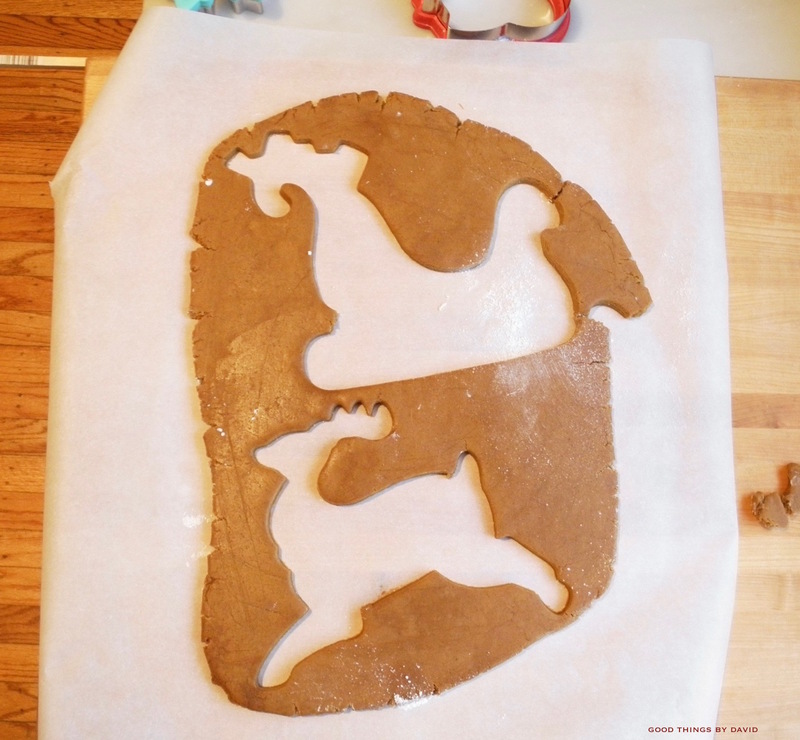 For large cookies (6"-9") use two large spatulas to transfer onto silpat-lined or parchment-lined cookie sheets. Bake and cool the cookies according to my directions. 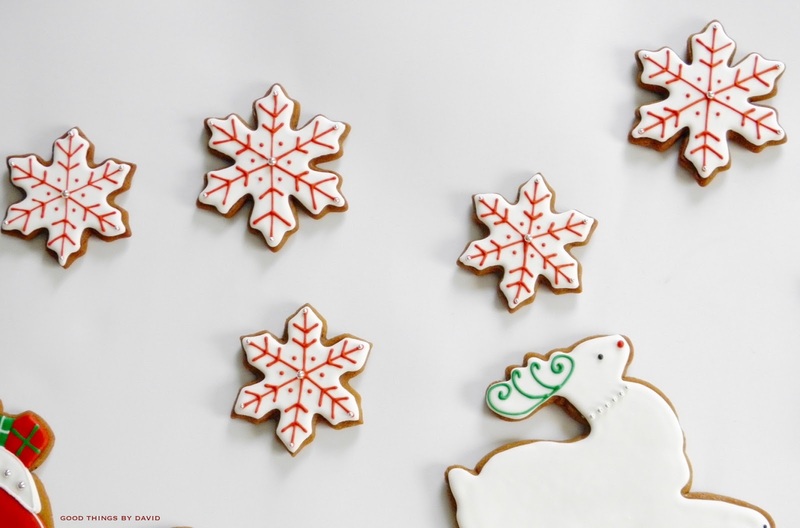 Gather all of your tools and ingredients before you begin to decorate the gingerbread cookies. 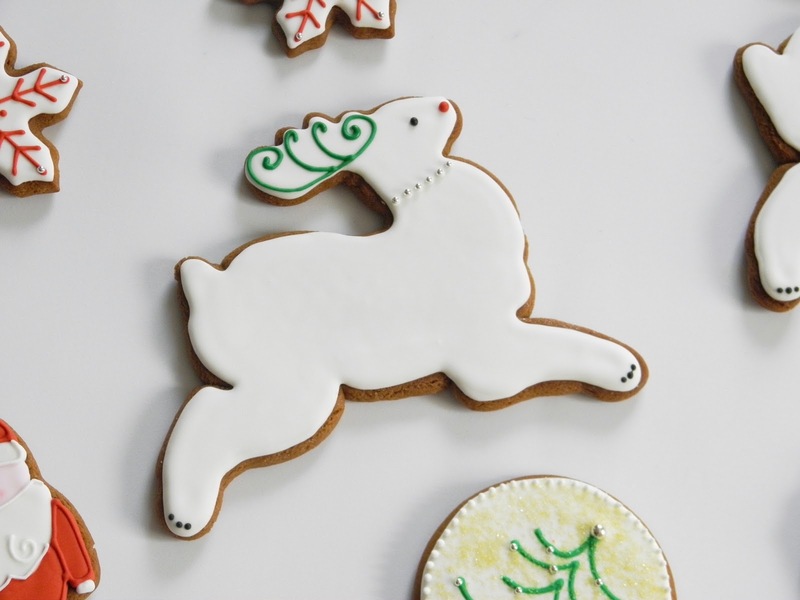 Make at least 2 batches of my Perfect Royal Icing (it's always a good idea to have extra). Any leftover icing can get placed into zip-top bags (air taken out) and get frozen for several months. 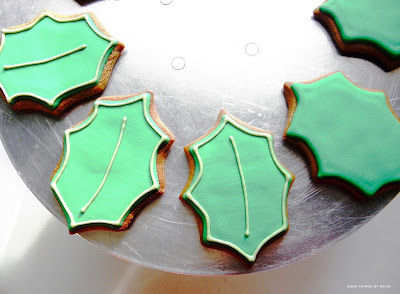 For the holly leaves, pipe a bead of forest green royal icing along the perimeter of the cookie using a #2 piping tip, and immediately flood it with the same color. Let the base dry completely. Using royal icing tinted pale green (I used avocado gel paste), pipe a bead of icing with a #2 tip along the perimeter of the cookie and a vein down the middle of the leaf. You can pipe veins toward the points of the cookie (this is optional). Let the cookies dry. Done! 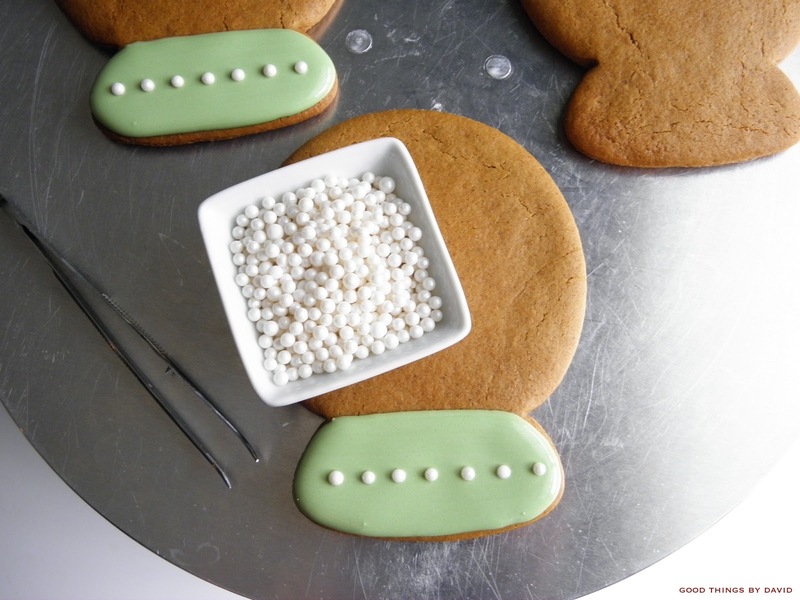 For the gift tags (cut out a hole on the top hanging portion of the cookies as they come out of the oven), pipe a bead of royal icing in a pale avocado color along the perimeter of the cookie and a circle to block off the hole using a #2 piping tip, and immediately flood the base. Let this dry. Pipe dots of royal icing in the center of the cookie and immediately arrange holly leaf candies to create a wreath. Using red royal icing and a #2 piping tip, pipe red dots for holly berries and let dry. This is what the finished cookies like. I love their simple designs and their holiday colors. 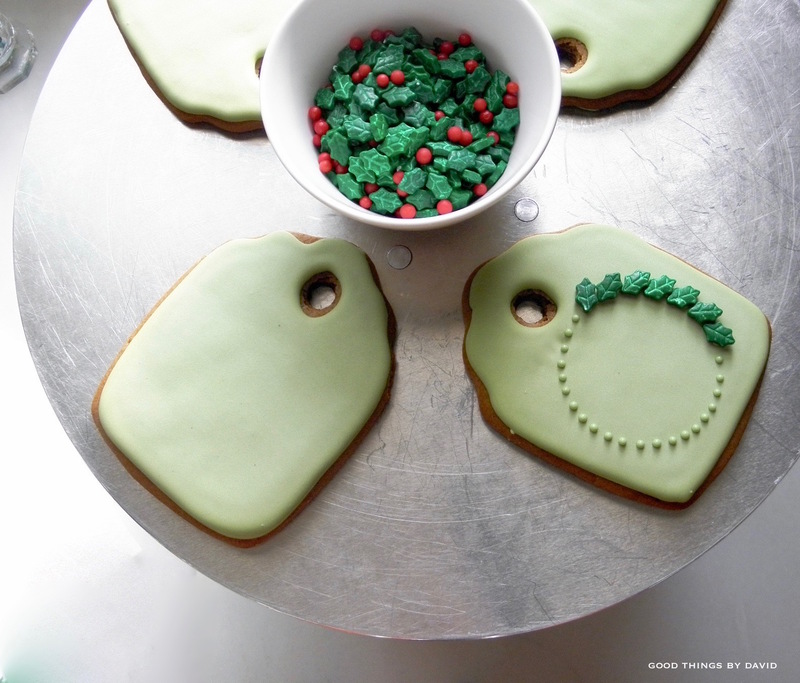 The gift tag cookies can get attached to homemade gifts or they can even serve as favors for your holiday dinner. Personalize them by piping a monogram in the center of the wreaths if you wish. I love these snowflakes! Pipe and flood the bases of the snowflakes in white royal icing and let them dry completely. 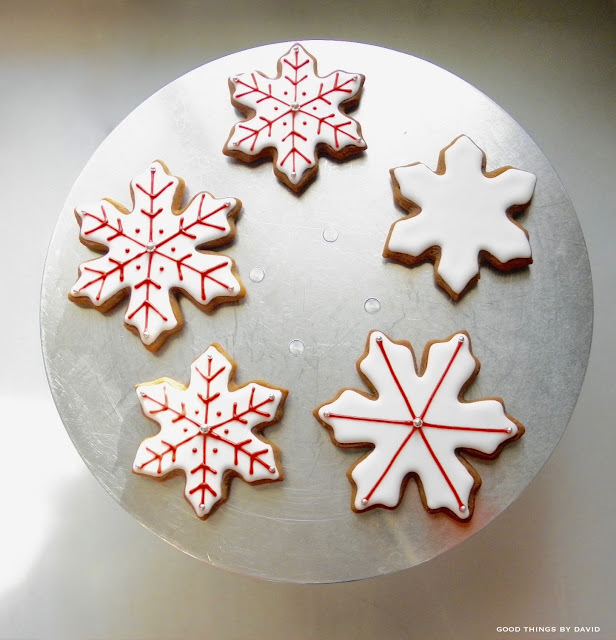 Using a #1 piping tip and red royal icing, pipe spokes down the center of the snowflakes making sure they are even. Using kitchen tweezers, carefully center a large silver dragée in the middle of the snowflake, and then carefully place smaller dragées at the ends of the snowflakes. 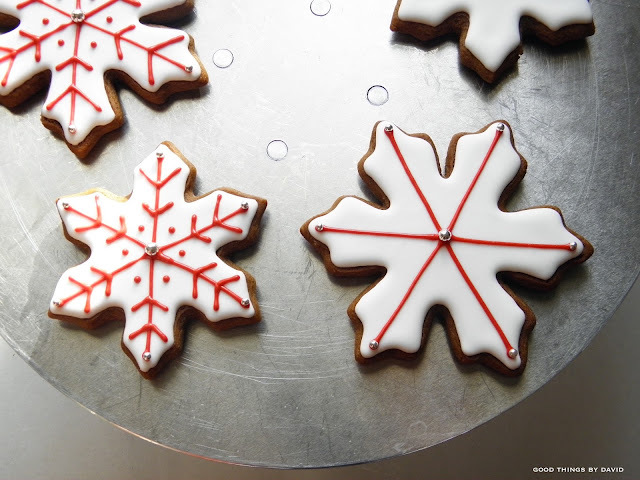 Continue piping stems and dots throughout the snowflake as shown. Let the designs dry completely. 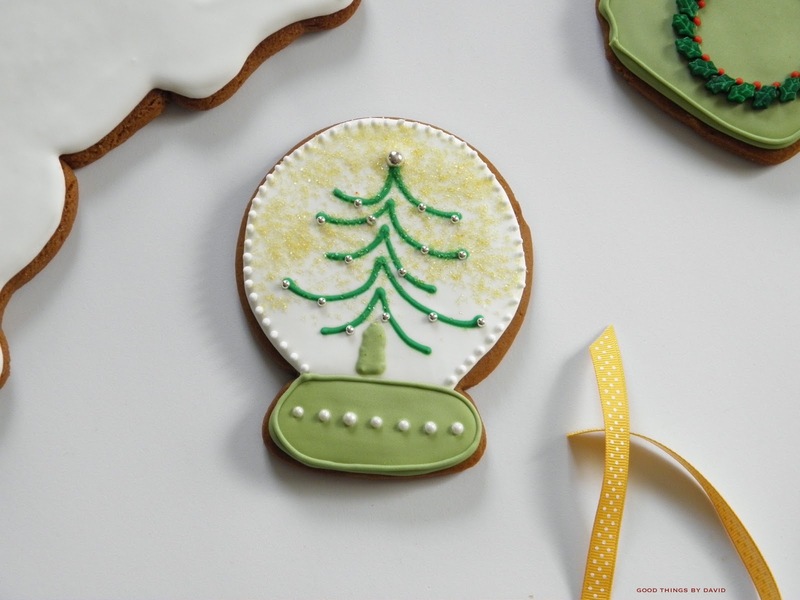 Using a sturdy cake turntable like this one by Ateco makes quick work of decorating several cookies at once. It’s my preferred way to make these types of cookies. Don’t the snowflake cookies look gorgeous? I can see these being used to decorate a tree for Christmas. But, they make great gifts too! The snow globes are as simple as can be once you locate a good snow globe cookie cutter and bake your cookies. Outline and flood the base of the globe in a pale avocado royal icing using a #2 piping tip and carefully center pearl candies (these are from Williams-Sonoma). Let this dry. Outline and flood the globe in white royal icing using a #2 piping tip, and while the base is still wet, pipe the minimalist branches of an evergreen tree in forest green-colored royal icing using a #1 piping tip. Immediately, but carefully, attach silver dragées here and there so that they resemble Christmas ornaments. Sprinkle the cookie with either silver or gold fine sanding sugar to give the illusion of glitter. Let the cookie dry completely. Using a #1 piping tip and white royal icing, pipe dots along the edge of the globe. Let dry. The reindeer are also quite simple. 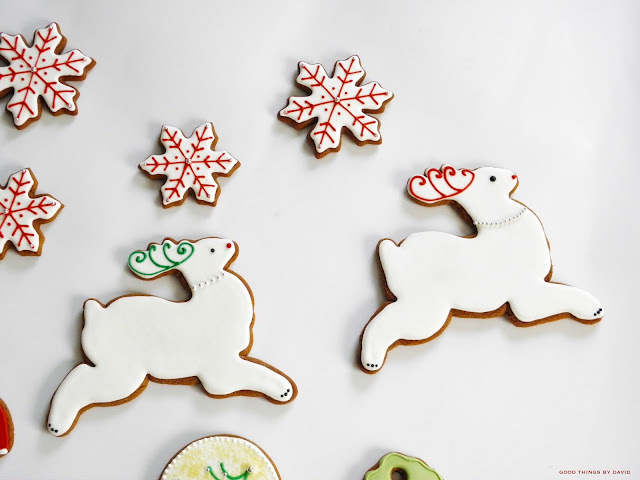 All you need to do is outline and flood the large reindeer cookie using a #4 piping tip (if your deer are small, use a #2 piping tip). While the base is wet, carefully place silver dragées along the neck of the deer to mimic silver bells. Let the base dry completely. Using a #1 piping tip and either red or green royal icing, pipe the antlers as shown. Using a #1 piping tip with black royal icing, pipe dots for the hooves, and a dot for an eye. Don’t forget to pipe a nose using a #1 piping tip with some Rudolph red royal icing. Let the cookie dry. These reindeer are so charming and very much ready to guide Santa’s sleigh. Speaking of Santa Claus, cut out cookies using the Wilton Penguin cookie cutter, making sure to trim off the penguin feet before baking. This makes Santa’s belly nice and round. 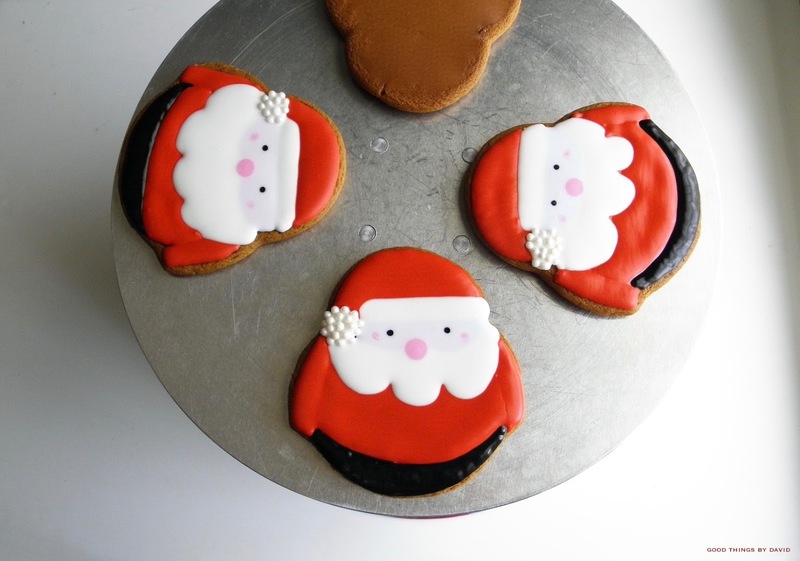 Using a #2 piping tip and red royal icing, outline and flood Santa’s hat & coat (arms and body). Using a #2 piping tip and white royal icing, outline and flood the trim of Santa’s hat (don’t forget the ball at the end of the hat—add candies if desired) and the beard. 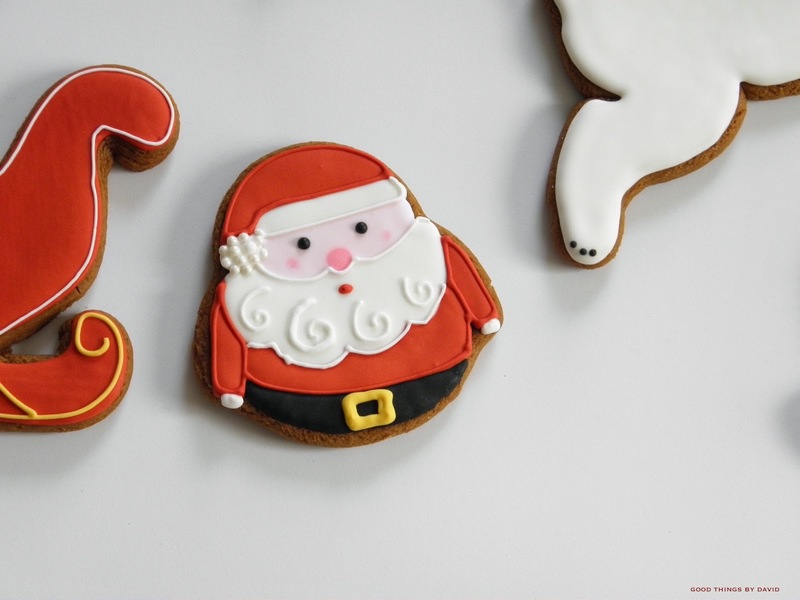 Using pale pink royal icing and a #1 piping tip, flood Santa’s face. While wet, add a small pink dot on each cheek (swirl this with a toothpick) and add a larger dot for a nose. Using a #1 piping tip and black royal icing, pipe a belt for Santa. Let the entire cookie dry. To the dried cookie base, pipe the corresponding colors of each area to accentuate, using #1 piping tips. Add white gloves, a yellow belt buckle, white swirls for a beard, small black dots for eyes and a little red dot to mimic Santa’s tongue. Adorable! Last, but not least, is Santa’s sleigh. This special cookie cutter from Old River Road was a gift from one of my dearest friends. I love the cookie shape and the generously proportioned treat. 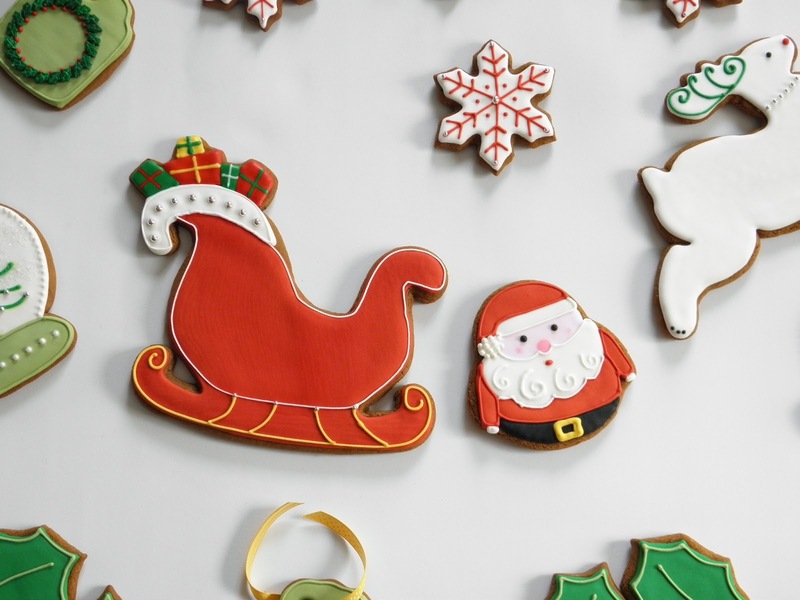 Using a #4 piping tip and red royal icing, outline and flood the entire body of the sleigh. Let dry. Outline and flood Santa’s blanket in white royal icing with a #2 piping tip. 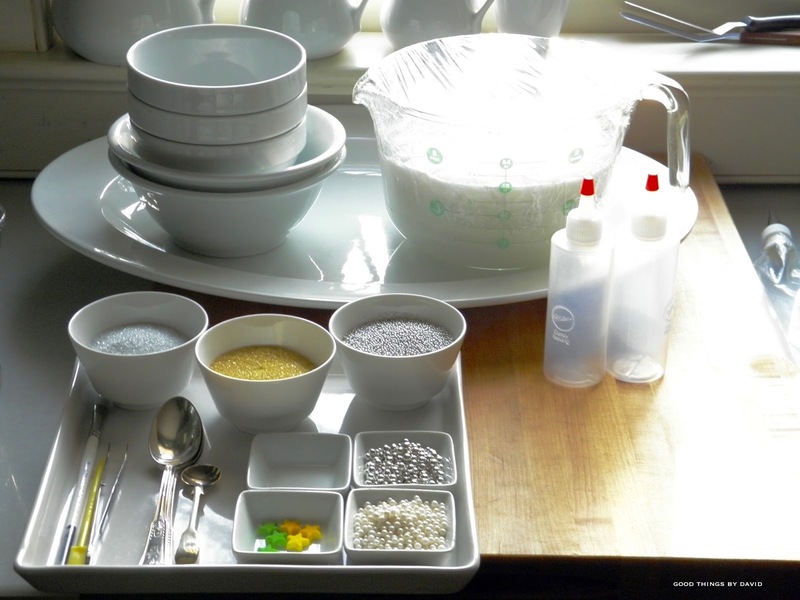 While wet carefully place silver dragées. Let this dry. Using red, green, white and yellow royal icing, pipe the gifts on top of the sleigh using a #1 piping tip. Don’t forget to add ribbons in an alternating color. Let the cookie dry completely. Using #1 piping tips, pipe a white outline for the body of the sleigh and the yellow stanchions and swirled runner on the base of the cookie. You can attach silver dragées if you wish. I think that this is by far my favorite cookie of the entire bunch. I’m hoping to make more of them in the coming days so that I can send them to my niece and nephews. I clearly remember when I was a child how mom used to wake us up on Christmas morning by telling us that we had to hurry into the living room, because Santa was delivering our Christmas presents. My older brother and I would jump out of bed and run down the hallway into the living room to a lit tree that was covered with lots of gifts underneath. Somehow we never got to see Santa because he was always gone before we could get there. Mom always had the old excuse that we had just missed him flying off on his sleigh, but that perhaps next year we would get to run into him. I love my mom for letting us believe in Santa while we were little. Create your very own Christmas magic for the little ones this year and include some Santa Claus cookies. Everyone is going to love them!